Level Six Series 9011 safety gloves available from Diplomat Blades combine innovative industrial puncture protection with industry-leading cut resistance to offer a new standard for hand protection. HexArmor products are engineered to provide users with superior levels of hand protection in workplaces where the risk factor is high. 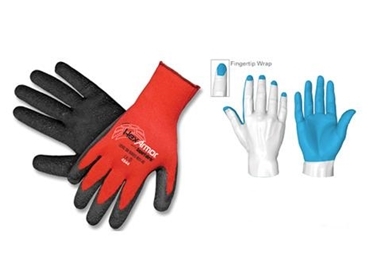 Their entire product range covering safety gloves and arm guards incorporate the Science of Safety, helping to reduce injuries and lower PPE costs in harsh work environments. Level Six Series safety gloves are made from SuperFabric material for cut-resistance that exceeds ISEA/CE Level 5 (in noted enhanced areas). Level Six Series work gloves offer high levels of puncture protection to the hand from wires, metal, wood and glass. A comfortable cotton blend shell with wrinkle rubber palm coating offers exceptional dexterity and feel. Additionally, the protective gloves can be laundered safely. Level Six Series industrial safety gloves are recommended for application in general work areas, maintenance, glass, metal and wood handling as well as waste handling and recycling work involving metals, plastics or paper.